“It strikes me as being Argentina's equivalent of a great vintage of Lafite-Rothschild”. Nicolás Catena Zapata has an intense dark violet color with blue-black tones. A complex wine with delicate aromas of black cherry and licorice, it is enlivened by minerals, violet, spice, and herbs. The palate is sharply delineated and impressively concentrated, with a serious backbone supporting its very fresh currant and mineral flavors. The inaugural 1997 vintage of this Cabernet Sauvignon and Malbec blend set a new standard of quality for wines from South America when it won a series of blind tastings against other prestigious cuvées from around the world. Nicolás Catena Zapata is made from a plant-by-plant selection of historic rows in the Catena Zapata vineyards. 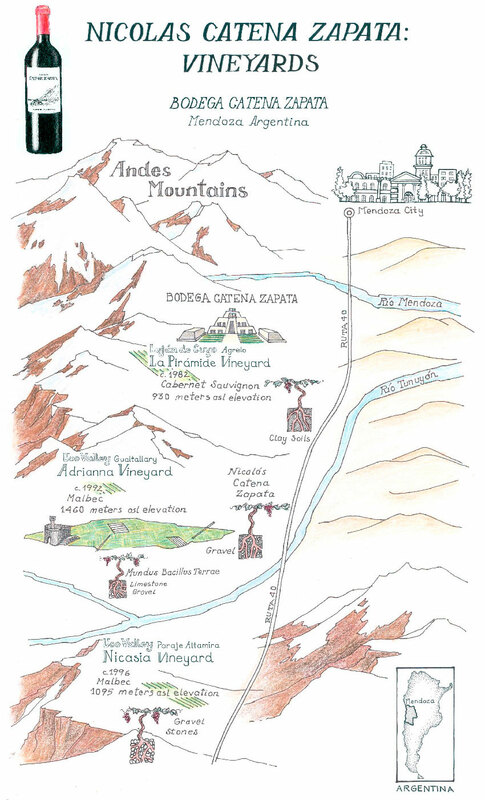 The wine is made from over 200 separate microvinifications representing different rows, altitudes, and harvest times. The wine is aged in French oak barrels for 18 months. It is only produced in outstanding vintage years.